I was born just outside Detroit during the summer of the 1967, when rioting and fire swept through the city. Throughout my childhood, we ventured downtown for concerts and field trips and special events, but our life was mostly centered in the suburbs (when we weren't posted in Ohio or Florida or Brazil). While in the 1940s and 50s Detroit shared the same dynamic sense of possibility of today's Silicon Valley, by the 70s and 80s it was in serious decline. We simply didn't go downtown to wander about. We had a fascinating visit. From the ruins of a city many saw as lost has emerged a vibrant, edgy community. Don’t misunderstand me - Detroit still has plenty of problems. But city leaders - chief among them Dan Gilbert of Quicken Loans and the Ford Family - are determined to rebuilt the city, and are off to an exciting start. It is now exactly the sort of place you might like to spend a weekend wandering about. 1. The Detroit Institute of Arts - Once upon a time, our family would venture downtown to take in Sunday Jazz Brunches in the Kresge Court of the DIA. In 2014 the city came close to closing the DIA and selling the masterpieces to help pay the city’s debt - I’m so grateful they didn’t. Enter the Rivera Court to admire the mind-boggling Detroit Industry Murals, created as a tribute to the city’s manufacturing base and labor force of the 1930s. If you have the time, grab one of the hand-held devices at the museum’s Rivera Court Information Desk for a multi-media tour. 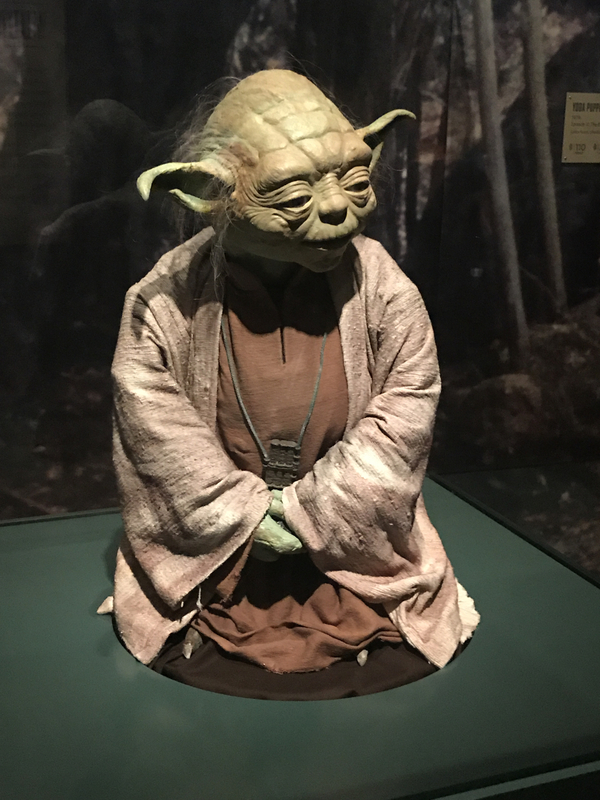 Beyond the murals, I was quite smitten with the American and Impressionist collections, and The Star Wars and the Power of the Costume exhibit was a whole lot of fun. A tiny glimpse of the sweeping The Diego Rivera Detroit Industry fresco. 2. Sister Pie - Not sure how it began, but I’ve been drooling over the Sister Pie Instagram feed for months now. 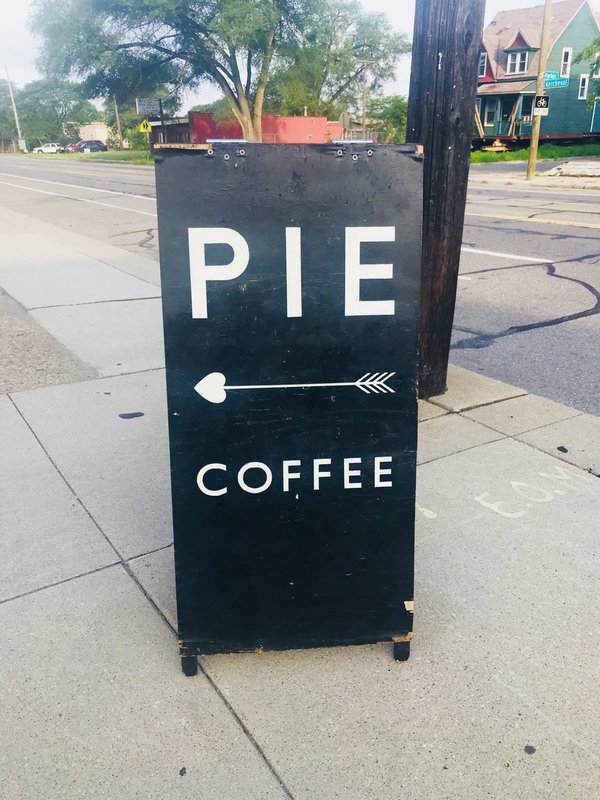 The gals at Sister Pie are constantly changing up their menu to reflect the local agriculture of Michigan with rustic pastries in unusual flavor combinations. I dragged the family out of bed to head to the West Village for an early morning breakfast feast, and am not ashamed to admit we indulged in Salted Maple and Blueberry Blossom Pies for breakfast. And buttered corn scones. And took a bag of one of each of the cookies in the case to go. Perfection in baked good form. Cookbook = Pre-ordered! I may have left with a bag full of one of each of these cookies. Sister Pie, please open a shop in DC! 3. 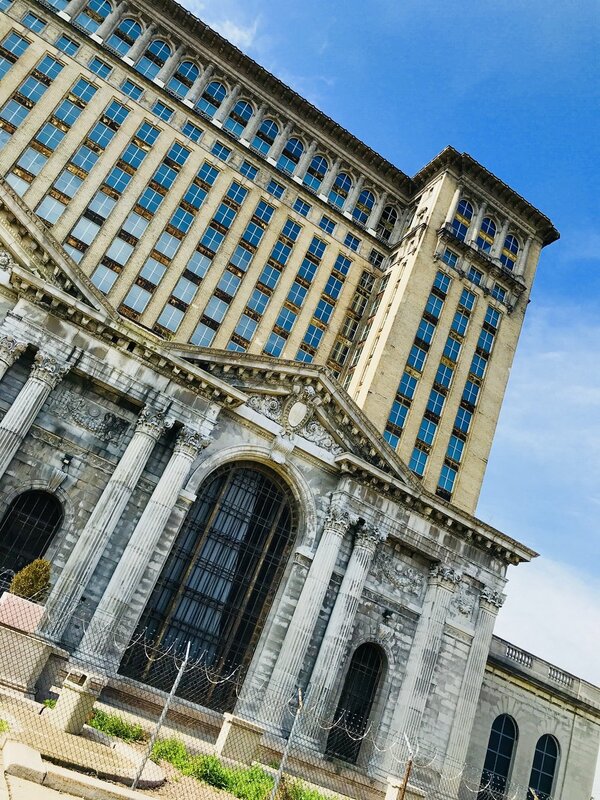 Show Me Detroit Tours - If you go to Detroit, you must call the warm and super-knowledgeable Pat Haller at Show Me Detroit Tours. Turns out she and all of her sisters went to my high school (hello Mercy! ), but (unlike me) she has spent her lifetime in the area and has become an expert in all things Detroit. We buckled ourselves in to her comfy minivan, and she drove figure-eights around the city center, filling us in on the history, politics, and developments. There wasn’t a question she failed to answer. We popped out of the car every now and again - to admire the mosaics in the Guardian Building, or the Lafayette Greens or do a bit of shopping in the Midtown district. Her tour gave us the sorts of insights that would have been near-impossible to understand on our own. The Old Train Station, slated to be renovated soon my the Ford Family. Reality Check: Still devastated neighborhoods minutes from the City Center. 4. Midtown Shopping - In a nod to my Detroit-ish roots, I’ve had a Shinola watch strapped to my wrist for a few years, and wanted to stop into their flagship store in Midtown. Oozing urban cool, this purveyor of watches, leather goods, and bicycles (mostly, as it turns out) manufactured in Detroit did not disappoint. 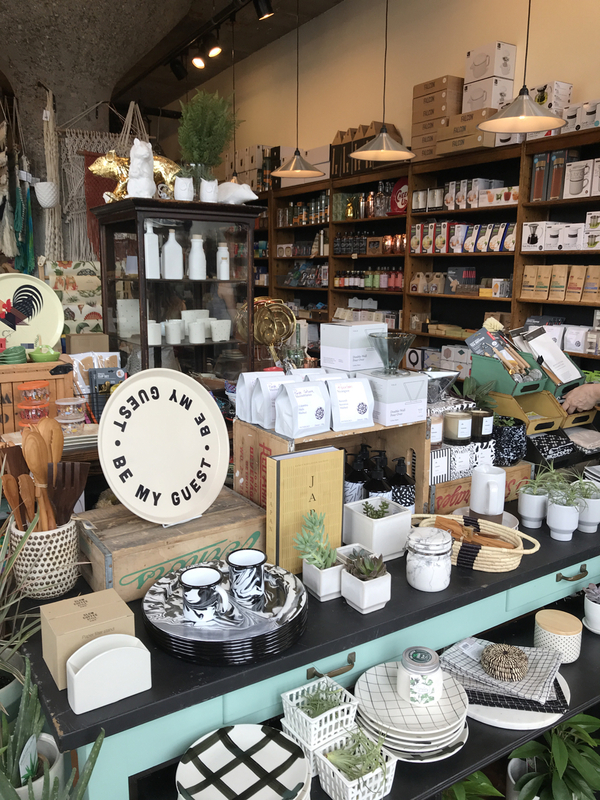 My dad and brother loved Third Man Records, while mom and I popped into Nest and City Bird, both featuring lots of nifty made-in-Michigan home goods. We then stopped for an iced coffee in Avalon International Breads. 5. Urban Gardens - As I’ve been following the story of Detroit over the years, I’ve been fascinated by the idea that urban gardens have played an important role in the city’s resurgence. I was sad to have just missed the Annual Garden Tour hosted by Keep Growing Detroit (next year? ), but was delighted to wander the Lafayette Greens downtown, brimming with edible plants. Yes, I certainly loved this one! 6. So Much New Development - Since Dan Gilbert moved his Quicken Loans to Downtown Detroit in 2010, he has poured billions of dollars into the revitalization of the city. Evidence of new projects were everywhere - renovations of long-vacant buildings and brand new projects. The old Hudson’s Department Store has been razed to make way for a huge new multi-use development, and a Shinola Hotel is in the works. The Drawings for a Mixed-Use Space where the Hudson's Department Store once stood. 7. 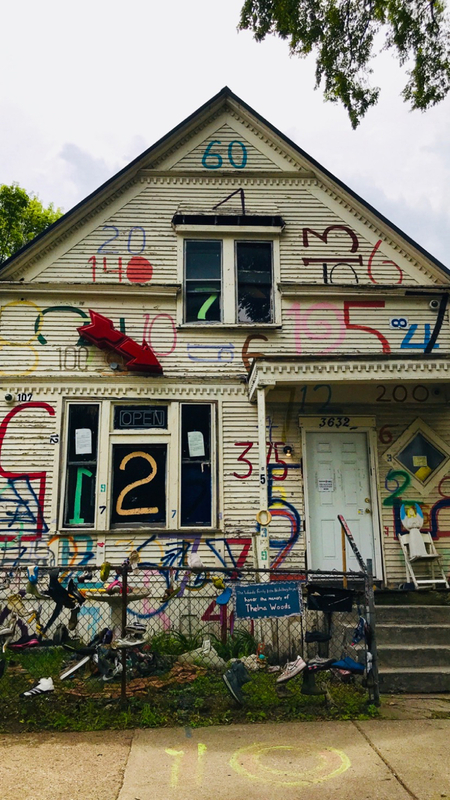 The Heidelberg Project - While there may be exciting new development in the city center, much of the city is still mired in poverty. 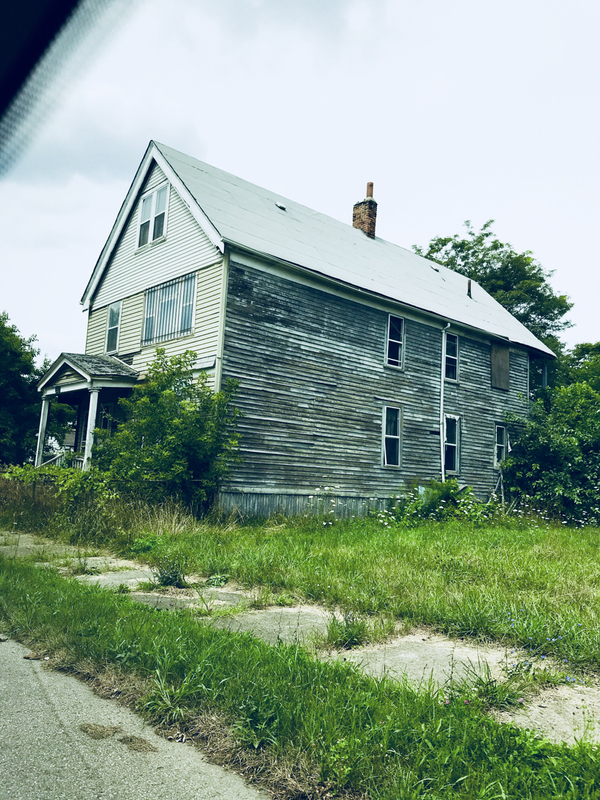 Pat drove us just a few miles from downtown to areas where entire city blocks had been razed, with perhaps just one or two dilapidated houses remained. Tucked into one of these neighborhoods is The Heidelberg Project. Started in 1986, local Tyree Guyton began to reclaim an area that had become so run-down and unsafe that people were afraid to walk through the area, even in broad daylight. He and a band of local kids used paint and local refuse to transform abandoned houses into wildly creative works of art. 8. Tigers (or Lions or Redwings or Pistons) - We intended to take in a baseball game at Comerica Park as part of our nostalgia tour, but yours truly misread the schedule, so turns out the Tigers were away while we were there. Pat did point out that all the Detroit sports teams play in new facilities downtown, so be sure to check the schedules before you go. 9. Street Art - Everywhere you look, murals and graffiti bring a creative jolt to the downtown area. Much of the art is authorized, some is not. 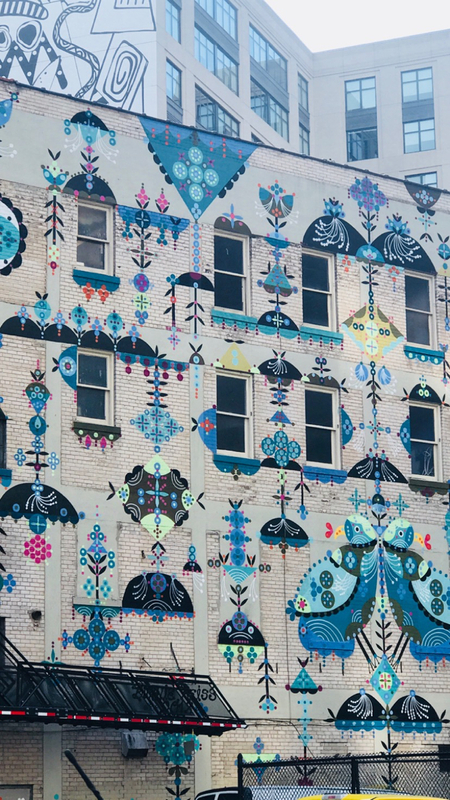 I discovered after I left that entire tours are devoted to exploring Detroit’s street art scene. I particularly enjoyed this piece from the Detroit Free Press highlighting 35 of the best. 10. The Restaurant Scene - I never seem to have enough time in a town to eat in as many places as I’d like, but we hit up a few treasures during our visit. Let’s start with the best - actually one of the best meals I’ve had in recent memory. Chef John Vermiglio killed it at Grey Ghost. This is the sort of flat out delicious food with big heart I adore. I wanted to sample everything on the menu - and between the four of us, we came darn close. Starter highlights included fried bologna on a waffle with cheddar sauce (trust me on this), the miso cured cabbage, and the diver scallop on dan dan noodles. I’m one of those gals who orders the meat because the sides look divine, so because the Lamb T-Bone came with spring peas, green olives, grilled snap peas and queso fresco, I was sold. Next time I head to Detroit, I’ll book a table here before I book the plane ticket. Other spots we tried: Stopped in for drinks at Selden Standard - would definitely try to grab a table there next time. Had lunch at The Apparatus Room. The renovated fire station gets high marks in my book for the ambience, but I think ordering the carrot salad was a mistake - I’m struggling to find something we ate I would recommend (perhaps the burger would have been a better call). I’d give it a try though - the service was lovely. I would definitely give a shout-out to the perfect Italian-style espresso at Urban Coffee. We shared our other dinner with extended family at Prime and Proper. This is a swanky, the-place-to-be-seen steakhouse, with truly fabulous service - and jaw-dropping prices to match. ($19 for a side of macaroni and cheese… really? You can’t even imagine how much the steaks were.) And the prices are not on the website. Just sayin’. Most of the food was quite good, but with all the fuss about the dry-aged steaks, they weren’t nearly as good as the ones at Grey Ghost. The dessert was the highlight - I have no idea how much they charged for the Peanut Butter Pave (other than lots), but THAT was worth every penny. Fancy schmancy layers of peanut butter gianujua, caramel, peanut brittle crunch with a dark chocolate glaze… wowza. The more we talked to people, the more places we wanted to stay and try - the restaurant scene in Detroit is emerging as a force. 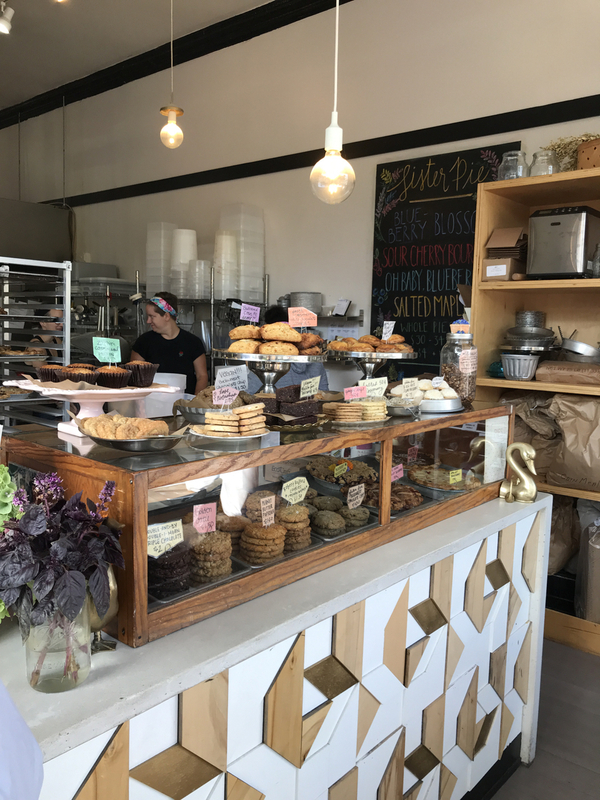 We were definitely sad to have missed the chance to eat at Shewolf and Mabel Grey Kitchen, or grab a taco at the outdoor space at Clementina. Strong cocktail game at Selden Standard - will book a table for dinner here next time. All that and I didn’t even get a chance to get out on a bike or explore one of the local bookshops or stop in to the Motown Museum. I’m ready to go back - would anyone like to join me?